Mrs. Sarah Ann Burks, age 66, passed away Saturday, January 5, 2019. She was born in Muskegon, MI on April 15, 1952 to Samuel & Willie Mae (Brown) Johnson and married Glinnie Burks Sr. on February 25, 1975. Sarah was a member of Greater Grace Church. She had been a loving wife, mother and grandmother who enjoyed singing with the Jimmy Dowell Choir, loved to cook and casino trips. Children, LaShonda Burks, DeQuita Burks, Glinnette Burks, Sheneta Moore, Col. Glennie (Tiffany) Burks Jr., Marcus Burks Sr., DeMarrieo Burks; 18 grandchildren; 16 great grandchildren; stepchildren, Climmie (Bobby) Fountain, Bobbie Nell Burks; siblings, Clarence L. Johnson, Thomas L. (Phyllis) Johnson, Charles E. Johnson; many nieces, nephews and cousins; friends, Caroline Briggs, Francis Garrett, Patricia Flournoy. 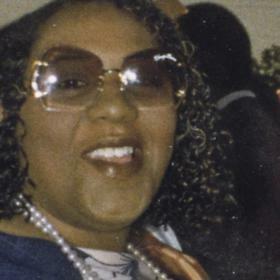 She was preceded in death by her parents; husband, Glinnie; grandson, Rodriquez Burks; great granddaughter, Raelyn Burks; step children, Jessie Mae Long & Essie Bell Burks; brother, Willie Sylvester Johnson; sister, Clara Mae Johnson and special niece, Debra Johnson Harris. Saturday, January 12, 2019, 11:00 AM at Kingdom Embassy Covenant Church, 3025 Glenside Blvd, Muskegon with Pastor Arthur Duren officiating. Interment in Evergreen Cemetery. Friday, January 11, 2019 from 2:00 PM to 6:00 PM at Clock Funeral Home – Muskegon and Saturday, one hour prior to the service.